Australia’s four largest newspaper publishers have come together to launch an industry wide positioning and brand campaign that demonstrates the influence of newspaper media and re-states to advertisers why newspapers get results. The campaign is the largest marketing initiative ever undertaken by The Newspaper Works, the industry body that represents APN News & Media, Fairfax Media, News Corp Australia and West Australian Newspapers (Seven West Media). The Newspaper Works CEO, Mark Hollands, said: “This has been a real collaboration between the major publishers. We began with the premise of creating a message that was true for all newspapers in metropolitan and regional areas. The enthusiasm we have had from publishers and editors across the spectrum of newspapers in Australia has resulted in this campaign. The campaign, created by The Hallway, will appear in print and digital editions of newspapers and marketing trade media. The new positioning for newspaper media is – “Influential by Nature”. A print and digital campaign will launch the new positioning and features a series of powerful, real examples of influence that have achieved tangible outcomes for both the community and for advertisers. 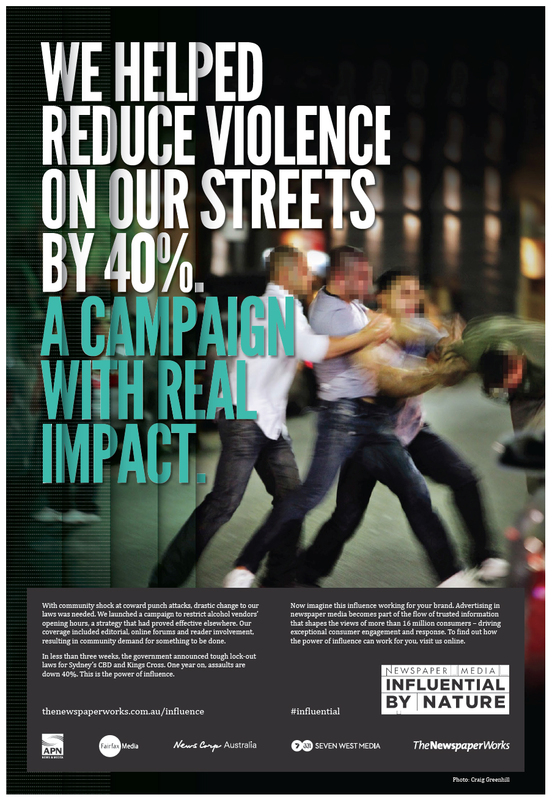 The first execution, launching today, demonstrates how a compelling and consistent newspaper media campaign aimed at reducing the incidence of alcohol-fuelled violence on Sydney’s streets resulted in a 40 per cent reduction in violent assaults. In coming weeks, The Newspaper Works will unveil a series of ads featuring examples of newspaper media’s influence from across the country and how advertisers benefit from this influence with successful campaigns. The Newspaper Works Chairman and CEO of APN news and media, Michael Miller, said: “Every effective and meaningful campaign needs influencers to drive trust, belief and action. Influence is an inherent characteristic of newspapers and we need to remind advertisers of the impact newspaper media brands still have today among consumers.